Rarely available, beautiful 2 BR unit in Villa Taviana. Very well maintained, high vaulted ceilings w/ tons of natural light. Spacious 2 level condo has granite countertops, newer appliances, water heater, in unit laundry, and oversized attic for additional storage. Unit has AC, private balcony and 2 assigned parking spaces. Close proximity to top rated elementary schools and shopping. Very family friendly community w/ fantastic amenities including pool, spa, fitness center, tennis court, and yoga studio., New double pane windows and sliding glass door w/ custom blinds throughout. Granite countertops w/ bar seating. Upgraded kitchen appliances. New W/D in unit. New closet doors in bedrooms. Newer carpet throughout and fresh paint. Oversized custom built attic for extra storage. Poway Unified School District across the street from Turtleback Elementary. 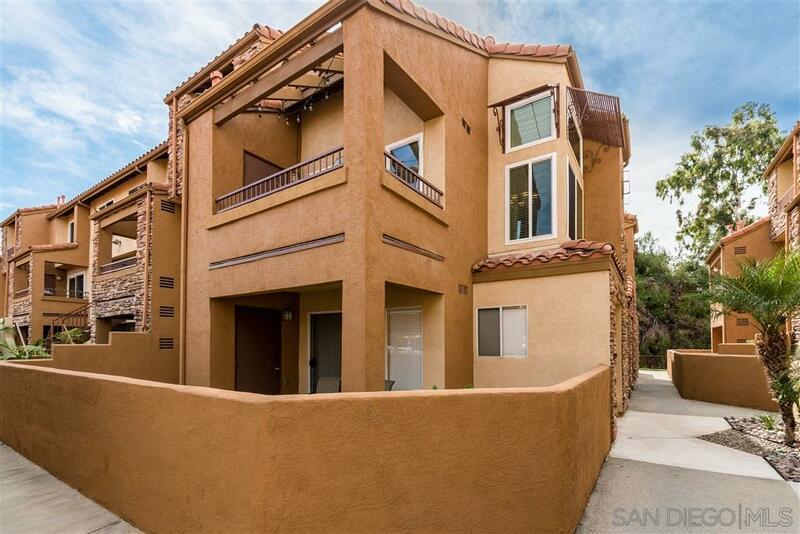 Close proximity to shopping center restaurants, and 15 freeway. Complex has 2 heated pools/spas, 2 BBQs, fire pit, tennis court, upgraded fitness center, and yoga studio w/ classes. Complex also equipped w/ 2 stations w/ electric car charging ports.